Game week 14 was an awful game week for me personally. On Saturday morning I was in the fortunate position of having two transfers in bag with only one game week left for the month. I had no injury concerns so I thought I’d take this opportunity to make some tweaks to my team to set up it better for the long term. Swapping two Leicester (mid table club) players for some Chelsea and Man Utd representation – two clubs who should be aiming for a top 4 finish. At that point in time I could only see this as an improvement. Both Chelsea and Man Utd have decent fixtures in December as well. Fast forward to today and I’m waiting for my December transfers already with injuries to Aguero, Mane, Robertson and Shaw. Hopefully the latter three are all only knocks but either way it’s far from a situation I wanted to find myself in. Had there been more information about Aguero being injured, I’d have probably swapped him for Aubameyang on Saturday and kept Maddison. Ironically Maddison then goes on to score twice in a week and pick up the star man last night. This has resulted in a drop on the leaderboard and I’m really hoping this isn’t a turning point for the season. I’ve been cruising along with no real issues or big mistakes so far this season and I wanted this to last as long as possible. Doherty continues to score points despite Wolves not keeping clean sheets. Richarlison got a goal last night. 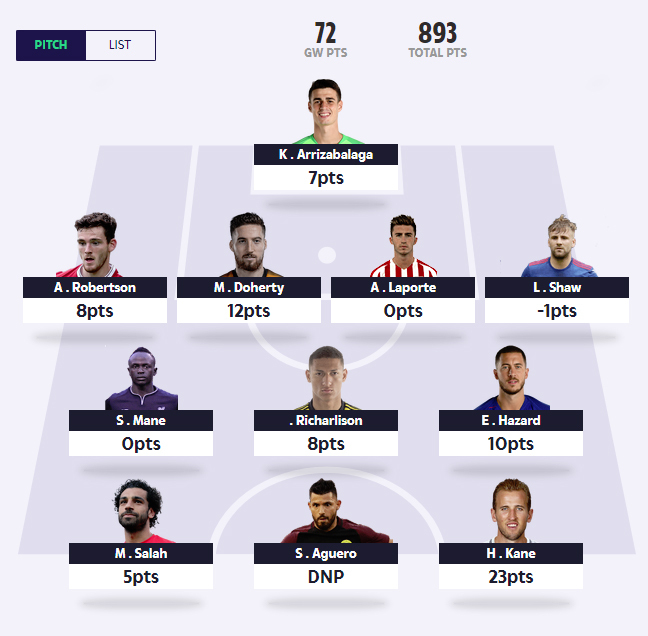 Hazard picked up 10 points for the week. Kane bagged 23 points with a couple of goals and a star man award. Aguero is injured. There’s also very little information about when he might return. This makes it difficult to know what to do with him. Leave him in and it could just keep rumbling on. Take him out and he might be back sooner than expected. Mane also has a knock and his form has been very patchy. Shaw missed last night’s game against Arsenal but I’m hoping he will be available again soon. Regardless of this, Man Utd still seem unable to keep a clean sheet. On the back of a couple of decent defensive results I thought they would at least keep a clean sheet against Southampton. The lack of a Man City midfielder is a concern but they seem to rotate so often that it’s hard to pinpoint which one to go for. Also Aubameyang picking up so many points appears to be costing me position on the leaderboard. If I could mathematically (which I don’t think I can) move on Aguero and Richarlison for Aubameyang and Sane/Mahrez this would be an improvement in the short term. However should Aguero return in December and start banging in the goals it won’t be possible to get him back in. If you’re going to take out Aguero the obvious choice for me is Aubameyang or Lacazette based on Arsenal’s fixtures. It is worth noting that whichever Arsenal player you go for – they are unlikely to play in the Europa League fixture. Whereas the other top clubs will get two fixtures this week with the final round of Champions League games. This would open up the idea of bringing in a City midfielder as a straight swap for Aguero. However City face Chelsea at the weekend which could be a low point scoring game. For this game week alone, I can’t see an obvious path to follow so I’d be interested to hear what other people are doing in the comments below. Great analysis as always DTT and I feel your pain as I had a similar score this week. The Maddison transfer must really stick in the throat though. You kinda get a plan in your head of where you want your team to go and then two or three injuries later your plans are in tatters. That’s how it’s felt for me anyhow. The Aguero situation is very tough to judge. Personally my hand has been forced and I’ll be taking Aguero out to help fund shifting Arnautovic out for a good replacement. I know this uses two transfers but I don’t want to take the risk of being stuck with a lame duck for a few weeks (Aguero). I also preferred the idea of getting in another City midfielder as none of the other midfielders of a similar price to Arnautovic really appealed to me. By getting in the extra City midfielder in Sterling I’m hoping that’ll cover any future scores from Aguero when he returns. I may have to leave Ryan in for a while yet so I at least have one transfer left to cover injury. Just need to prey to the Fantasy Football gods now for no further injuries. It’s a difficult situation regarding Aguero. From looking at what’s possible this morning, I could take Aguero out for Aubameyang and then change Richarlison for Mahrez or go back to B. Silva. This is an improvement while Aguero is out, but it doesn’t leave me any options when Aguero returns – if he returns quickly and on fire from a goal scoring perspective then I’d have no way to get him back in until January. I decided to gamble on the aguero unjury and replaced him for jesus. in hindsight i wished i’d have replaced him for Auba given his return against spurs! I want auba for Dec, so now need to decide on whether i change jesus for him. Out of interest, Auba will rise in price this week, but does anyone know if Jesus will also rise? The answer to this will be the basis of me using my final november transfer on changing jesus or Auba , alternatively changing my keeper (currently ryan) who i believe will drop in price. I couldn’t imagine Jesus went up in value but I’ve not checked. I’d much prefer Aubameyang over Jesus if the swap is on though. Any news on when Aguero is back? Tough one because City play after Arsenal this week so we won’t get to check line ups. Mendy out long term so he needs replacing. Burnley are conceding at an alarming rate so I’d look at upgrading him too. Could go Mendy to Doherty to get he extra funds for Hart upgrade? Mane and Aguero are injured short-term as well but that would leave you with one transfer left and December is a long month. You could always leave Hart and hope they tighten up. You could the replace the injured Aguero or Mane? Or you could wait it out with those two. I’d be looking to move Mendy and Martial on first. Possibly for Kane and a cheaper defender. Andy Robertson trained in full today so good news for owners. Joe gomez out for six weeks with a fractured lower leg. We need to know how long aguero is out for before deciding , hopefully we’ll get that info before weekend? If he’s ok soon he could score well over Christmas , might even come back a bit fresher !! Yeah I can’t say I’m keen to lose him if he’s going to be back very quickly but it’s always a bit of a lottery. Lost Gomez last night, as a replacement thinking Rudiger, Azpilcueta, or even Trippier, any thoughts appreciated, current defence Gomez,, Laporte, Robertson. You’d expect TAA to be nailed on for the next six weeks as well. Mane out, for City midfielder, if performing well leave as hardly anyone above me in my mini league has him, or Hart out for probably Ederson, as I will have Chelsea cover in Rudiger/Azpilcueta, press conferences tomorrow should hopefully be enlightening. Get rid of Willian, rubbish. I have Gomez, he’s been great value for the money so far. With him injured, I initially thought Lovren is nailed on to play so maybe a good choice, but he’s still 0.4m more expensive than Gomez! Likewise, you need money in the bank for Rudiger, Azpilicueta and Trippier. After looking through all the top teams, surely the best option by a country mile is Alderweireld??? 3.3m to Gomez 3.5m. He’s not likely to go up tomorrow, and neither is Gomez really, but is a straight swap without losing 2 transfers. Even if Alderweireld goes up and Gomez goes down, they’d be same price then. I know Poch likes to swap them about but with Sanchez injured and only Foyth to stay ahead of (alongside Vertonghen), he’s got to play a fair bit? I don’t think their fixtures for December are too bad. You could say that they have Barca and Arsenal to play, but Barca have already finished top of the group, so will likely play a second team, and Arsenal is in the league cup which is just a bonus game really. Anyone got a better idea to consider? Good pts Chris, was a bit concerned Alderweirald was dropped against Arsenal for Foyth, the kid has made several errors, but he is a great price, fixtures in general pretty good, away to Barca who knows the result, but I would be very surprised if they kept clean sheet. I’m reluctant with Spurs defenders at the moment. They seem to leak the odd goal or two rather consistently. Thinking of selling Willian for maybe cheaper defender then upgrading gomez , think van dyke is a must ? Yeah, my worry is with Chelsea midfielders is that whilst they may supply Morata with plenty of chances, he’s finishing like Jason Lee used to at the minute! It’s why I wouldn’t be surprised to see Hazard off the pace come the end of the season compared to the likes of Sterling, Sane, D.Silva etc. Chelsea desperately need a good striker in the January window. Should never have got rid of Costa. Leicester have some very tough games including Spurs, City twice, and Chelsea all in the next 3 GWs. Whilst Maddison has been great since his red card, surely there could be better options for December? Arsenal arguably have the best fixtures, making Auba / Laca highly attractive. Chelsea also have great fixtures after this weekend. I’ve been concerned with Hazards like of return but I think I’ll give him a few weeks yet. Some tough thoughts. If I swap Aguero for Auba, I’m really struggling to see who I could replace Maddison with (either defender or midfielder) at £3.9m or less. Anderson at West Ham is an option, and I’ve previously sang his praises. There’s also the want for Sterling / Sane / Mahrez. If I swap Aguero out for Laca instead of Auba, that allows me to upgrade Maddison to either Sane or Mahrez. Have to agree with AJF, you have a good solid team there. If your players are fit, stick with them as December is a very long month with the games coming thick and fast. I’ve had to make two changes with Arnautovic and Aguero, but if I were in your shoes, I’d just be making that one. Good luck! VVD is a player I’d like too but I’m going to have to leave my back-line as it is this month I think. He’s pretty much nailed on all season and he’s now becoming more of a threat in the opposition box too. Aguero is expected to return tomorrow apparently. Where did you read that Aguero is expected to return tomorrow? In any case, I had one sub left for November which I had to use last night, so swapped Aguero for Auba. If Aguero does return this weekend, he will have a tougher prospect away to Chelsea than Auba does at home against Huddersfield, so I had to play the odds. Arsenals next fixtures are nice so should be a good transfer considering ~Aguero has been rather slow. That’s the transfer that I’ll probably go with. If news doesn’t come out that Aguero is fit to play before Arsenal kick off I’ll probably make that change as well. If I switch Aguero to Aubameyang, I can switch Mane for Sterling / D Silva / Mahrez / Sane. Also, if I switch to Mahrez or Sane I still have the available funds to switch back to Aguero at a later date if he comes back and starts banging in goals. Thoughts? Tough one. I’m in pretty much the same situation. I’m almost certainly going to do Aguero for Aubameyang. I could keep Mane in and swap Richarlison for Mahrez or B. Silva but this would price me out of bringing Aguero back in. I could also do what you’re suggesting with taking Mane out for one of the cheaper options. I personally see it as a bit risky to take Mane out as he’s highly owned in the mini league I’m in. I guess if Mane isn’t starting for Liverpool you could explore the option of taking him out but I wouldn’t be surprised to see him back in for the Champions League game. I’d personally rather not take him out. That is true regarding how popular he is in the league I’m in too, I’m top and 8 of the 9 behind me have Mane. So I guess the risk is minimal to leave him in as everyone else around me has him. I think you are right on Aguero to Aubameyang IF Aguero doesn’t start – if he does I’d say hold off on transfers for another week? Reasonably happy with that team now, just unfortunately had to use the two transfers so may get burnt later down the line. If I can get to mid December with the transfer in tact I then have a decision on Ryan when fixtures get harder. Good Luck! Have a good trip to Lapland Chris. Team looks well set up for the month to me. My team has some similarities to yours including formation only difference I have Kepa, Gomez, mahrez, Sane , Maddison & Aguero. leaving 600k in bank and 1 transfer – any thoughts please ?? Seem like sensible choices to me mate. If I’d have had the funds I’d have probably gone Aubameyang also, but I see Lacazette as a decent cheaper alternative. With Aguero coming out I wanted to get an extra Man City midfielder to cover any potential Aguero hauls when he comes back, hence I went with Sterling. Some are looking at getting rid of Maddison but if I had him I’d be tempted to leave him for now and see how he does against the tougher teams. He may rise to it and have a blinder as he does seem to be in good form right now. If Vardy remains out he’s also on pens. Looks like a decent move – my only concern would be not being able to swap Aguero back in with the last transfer? Assuming you wouldn’t have enough funds to do that? Sitting 3rd in work dream team league with this team. Sky Sports News saying Mane and Aguero wont play this weekend. Gomez defo has to go. Both teams above me have Auba and Sterling so was thinking of trying something different. Thoughts? I’m personally going to take Aguero out for Aubameyang. I’d take Gomez out for a similar priced player from one of the top clubs – depends who much you’ve got in the bank but I’d make sure you can get Aguero back in. when is soon……….. other option could be swap gomez for robertson & aguero for Auba and leaving £1 mill in bank to use to bring Aguero back in if need be?? Ideally I wanted to get Sterling in for Mane as well as I own Salah and wanted extra City midfield coverage as I already have Mahrez. If I transfer Gomez to Sane I wouldn’t be able to get in Sterling this month and it would probably take 2 transfers next month. Any advice welcome on this guys, any other thoughts on a Gomez replacement? There would be no route to getting Aguero back in either would there? I’m tempted to do something similar but I can’t risk being unable to get Aguero. I don’t think I’m keen on having Matip, they have some tough games coming up as well. Also guaranteed to use another transfers to take him back out next month. It’s a tough one, your decisions so far have been pretty spot on so will be interesting to see what you do. On a side note, is anyone tempted by Martial? A few mistakes have started to creep in recently – taking Maddison out when I did wasn’t a good idea. I think Martial is injured. Have a great time in Lapland Chris. Still have three transfers and 1.7m in the bank. I am not looking to make any changes just yet, but the plan is to lose Richarlison after his next game and work out how to get another City midfielder in. Good thinking. I did have B.Silva earlier in the season, but I somehow managed to dodge his returns, so I lost him. Maybe he will be more profitable the second time around like Richarlison was. I’m thinking along the same lines. I could take out Richarlison for Mahrez or B. Silva but this wouldn’t give me a way of getting Aguero back in so it’s going to be a very tough call. any one know if Martial is injured? Due to miss the game against Fulham apparently but should be fit there after. Dare I use the 3 transfers from the off? With Aguero, Gomez and Mane all out for tomorrow I’m contemplating taking a huge risk. I wouldn’t take Aguero out yet. I think Mane will play against Napoli and Aguero given until at least next weekend to recover. I have to make the Aguero transfer in order to create funds for Anderson and Sterling. I can see Sterling doing well against Chelsea but it may be wise to hold off for another week at least. I can’t see how people are so easily getting rid of Aguero when he is more than likely to be back after tomorrow reading between the lines. Man city have some very easy games coming up. Also salah and mane have done absolutely nothing recently. I think you must get aubameyang in however it must be in place of salah in my opinion. I can see the case for Salah if both Aguero and Salah were fit. But in the short term Aguero isn’t playing this weekend and Liverpool play Bournemouth and then have a big game in the Champions League. “Mane boarding the team plane, would imagine it’ll be a late fitness test if he’s travelled. I transferred salah for aubameyang, and then Gomez for azpilicueta. I decided that Chelsea have some particularly more favourable matched coming up vs Liverpool and az seems to have a decent run recently. Useful to know – thanks. I’m going to stick with him and hope he features this week. To replace Gomez, with either Azpilcueta, Rudiger, Stones, but they play each other this weekend, & as for Europe, all the above may not play, moving on to Hart, abysmal form outside chance of clean sheet this weekend, wld like Keppa or Ederson but again play each other, Mane back probably for Napoli, but tempting to go for City midfield, think I’ll do just the 1 transfer, & play with possibly 9 players this weekend, can’t find a way round it. I’d be interested in what dream team tips thinks on Salah out instead of Aguerro. For me man city have easier matches coming us vs Liverpool, and salah really hasn’t been firing lately. Also I believe in my gut Aguero is only out for today and will be back next match. It’s a risk but I’d rather have aubameyang in who’s been great lately and take a chance. I’ve still got mane in on off chance they do start scoring for fun and hoping he picks up assist or two. I agree to a certain extent but Liverpool have something to play for the in Champions League and Man City might not risk Aguero in the week. As a result I’m going to swap Aguero for Aubameyang but then I’d have the option of taking out Salah to bring Aguero back in if I wanted to. Not for me – both potential to score big points but Salah has better fixtures this week and isn’t injured whereas Aguero might not even play this week. Aguero out Aubameyang in – can’t risk falling further behind with Aguero possibly not featuring this week. Leaves two transfers if I want to get him back in. 3 transfers left / 1m in bank. 2nd in League but person above has sterling,aubameyang. Any advice/opinions on my team ? Similar situation to me – the only change I’ll be doing today is Aguero out for Aubameyang. You are still making this move even if Aubameyang is on the bench today? Not impossible as he has played 90 mins last two games and Emery is known to rotate his team. Team news will be interesting. It would be fair to say this years DT has been a nightmare for me. Upto now every transfer I have made has back fired! I swapped Salah out for Aubameyang at the end of last month. Obviously Gomez needs to go but I’m also thinking of getting Sterling in as well. Also I’m not keen on Barkley. Do I transfer out Gomez n Barkley and put in Sterling and a very cheap defender like Schlupp at Palace? Any thoughts from you guys would be great. I’d be concerned if I was taking Aguero out and couldn’t see a way of getting him back in this month. Would you leave Barkley in and take out another for sterling freeing up some funds? I know Mane n Hazard aren’t firing atm but surely it’s only a matter of time. Any chance you could just review how you convey your updates perhaps as I don’t want to be left guessing? It’s a difficult one – I can’t email everyone because I’m often on the move when I make a transfer which means I’m on my mobile with no access to email addresses. If you clear the cache on your phone it will update or just look in a private browser. Still going strong on 918 points though. Anyone fancy taking the risk of aguero out for auba and mane out for shaqiri. Leaves 4ish mil in the bank and shaq has been scoring very well recently. Not a bad shout really considering we don’t know how long Aguero is out for a Mane’s form is down a bit. Decided to follow suit and put aubemayng in for Aguero. Just hope I don’t regret it if Aguero returns next week and salah doesn’t perform again today. If it looks like it’s going that way you could always swap Salah for Aguero next weekend.